Does anyone else LOVE Oreos as much as I do? (I’m pretty sure that’s a no, but I just thought I’d ask!) Seriously. Don’t leave me alone with an opened bag of Oreos if you want some for yourself. There might not be any left by the time you get back! Well, today’s recipe changes all of that. These Chocolate Oreo Truffles have the same amazing crunch and flavor of store-bought Oreos, but they have the added fanciness that holiday get-togethers deserve. Honestly, I used to be a little intimidated by truffle recipes. They seemed really fancy and difficult to make, so I would usually stick closer to cookie and cake recipes I was more familiar with. If you’re the same way, let me reassure you. This truffle recipe is actually pretty simple to make, and the taste is absolutely worth learning something new. 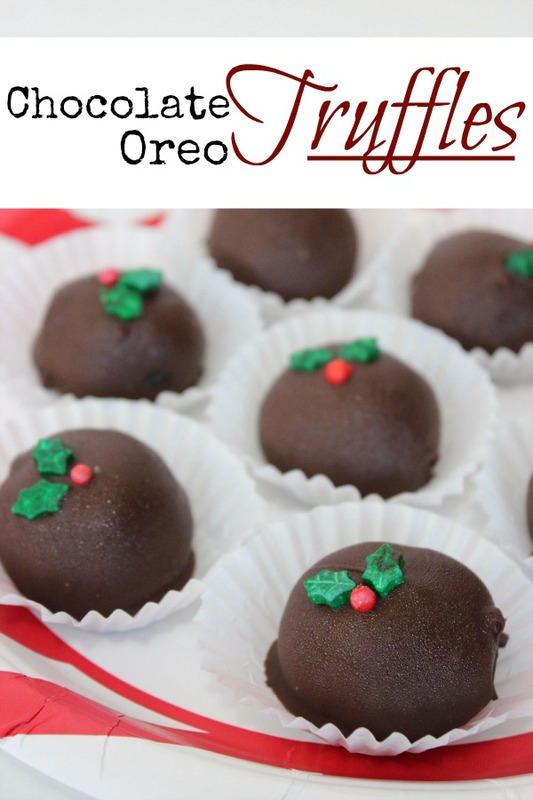 So whether you are looking for a holiday dessert recipe fancy enough to impress your in-laws, or you simply want to try something new, these Chocolate Oreo Truffles are a must-try! Line a cutting board or baking sheet with parchment paper. Finely crush Oreos in food processor. Combine cream cheese and crushed cookies until well blended. Form mixture into 1" balls and place on prepared sheet. Using a fork dip each ball into chocolate to completely coat. Shake off excess and return to tray. You can optionally decorate with candy decorations.